Ted Backer has extensive experience and expertise in environmental and utility law, commercial real estate matters, banking, administrative law, municipal planning and zoning, and general corporate and contractual matters. He has experience in the acquisition and sale of commercial real estate, including parcels with environmental issues, real estate; state and local practice before regulatory agencies, including State of Connecticut Department of Energy and Environmental Law, State of Connecticut Department of Health, and the Connecticut Department of Transportation. Backer joined Cramer & Anderson as a Partner in 2008. Prior to that, he was a partner at Pinney, Payne, P.C., in Danbury, CT, for 27 years. At Cramer & Anderson, he has been involved in synthesizing state, local and federal intergovernmental interests in complex matters. He has represented a wide array of clients including major corporations, banks, small businesses and individuals. 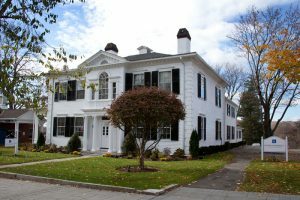 Backer resides in Danbury and is licensed to practice in Connecticut, New York and the District of Columbia. Successfully worked as local counsel to a national corporation divesting a number of water utility companies. Obtained conservation easement over Candlewood Lake on behalf of the Housatonic Council of Elected Officials by effectively dealing with Connecticut Light and Power, local, state, and Federal Energy Regulatory Commission (FERC) officials. Work closely with a number of small state-regulated water utilities on all issues, including acquisitions, expansion, regulatory matters, and contracts. Advise local banks and other private clients on numerous real estate projects (including those with significant environmental issues) on all stages of acquisition, development, approvals, financing and leasing. As a volunteer member of the Still River Alliance, created the acquisition of conservation easements along an open space corridor of the Still River in an industrial section of Danbury, Connecticut, and, since 2006, a volunteer Board Member of Shelter of the Cross, which provides transitional housing in a stable setting for older persons who are temporarily homeless. Appellate Court cases argued: Newtown v. Department of Public Utility Control, 3 Conn. App 416, 488 A.2d 1286; Re Investigation of Grand Juror into the Bethel Police Department, 188 Conn.601, 452 A.2d 935; Rotophone, Inc. v. Danbury Hospital 13 Conn. App. 230, 535 A.2d 830. Represent corporate and individual clients on matters regarding local and state agencies including the Connecticut Department of Environmental Protection, Connecticut Department of Transportation, Connecticut Department of Public Utilities Regulatory Authority, and Connecticut Department of Health. Kathy Dexter is a consummate highly knowledgeable paralegal who has many years of experience handling civil matters in the Danbury legal community including commercial real estate and banking matters. You can reach Kathy at kdexter@crameranderson.com or by phone at 860-355-2631 x141.